Brian McLaren’s reputation proceeds him. The author of popular books including 'A New Kind of Christian' and 'Naked Spirituality' has found himself in hot water for questioning traditional Christian views. In his new book 'Why Did Jesus, Moses, The Buddha and Mohammed Cross The Road?' Brian continues to question and re-define key doctrines. This has inevitably resulted in a fresh wave of both criticism and praise for the author. You’ve said you’re theology is encompassed within a different paradigm to most Christians. Is this why your views clash with others so much? How does it feel to be called a heretic? I read a quote from someone who said: "I won’t attempt to repeat all of the falsehoods that McLaren now believes and dispenses with impunity; I haven’t read the book (and won’t), but others with greater minds than mine have read the book and are more than willing to share their reviews..." – Is that the problem? People criticizing you who haven’t read you? 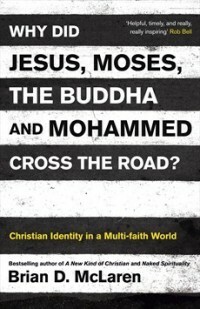 So why did Jesus, Moses, The Buddha and Mohammed cross the road? How do you view evangelism? What about proclaiming the supremacy of Christ? Interesting interview, Sam, look forward to part 2! Particularly interested in his comments about the dominant Biblical story - he seems to pit "He centered it in his proclamation of the kingdom or reign or commonwealth of God." against "a perfect creation and a fall into original sin. For some there will be salvation that will lead to a return to an eternal state of perfection and for others there will be perdition to hell." I can't really think that there would be many who would disagree with the notion that Jesus' coming is bound up with the notion of the Kingdom of God (not sure I remember the word 'commonwealth' appearing in the Gospels - reminds me a bit of Pullman's 'Republic of Heaven'...), so it looks like something of a false dichotomy (which is par for the course in emergent church rhetoric). The Creation->Fall->Redemption->Consummation paradigm is perfectly compatible with the idea of the Kingdom of God (see Goldsworthy's excellent 'Gospel and Kingdom'), so there is clearly more at play here... but this comment is getting too long, so I shall leave further comment to another time!